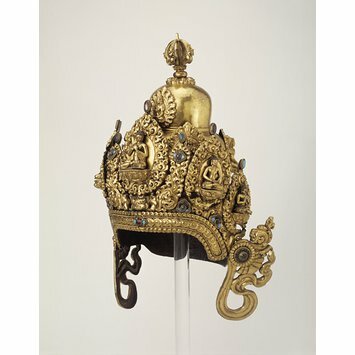 Elaborate crowns of this type are worn by Vajracaryas, Buddhist priests when officiating at religious ceremonies in Nepal. Vajracarya, "master of the thunderbolt", is both a caste and family name indicating those entitled to perform priestly functions. They command the highest rank in the Buddhist community, the equivalent of Brahmins in the Hindu context. They typically use both a vajra (thunderbolt sceptre) and ghanta (ritual bell) in these rituals. A painted Nepalese manuscript cover dated 1532 depicts such a crowned Vajracarya engaged in ritual on behalf of a donor and his family at a temple stupa; he is depicted holding both vajra and ghanta and seated before a fire altar and assorted ritual utensils, including an offering dish, mirror and miniature chaityas (stupas). The ritual crown depicted bears close comparison to the V&A example, with its forehead diadem and elaborate superstructure, and the ear-like pendants. This crown has individually cast medallions depicting Bodhisattvas positioned around the dome, with Vairocana in the centre; each is framed within an elaborate foliate medallion. 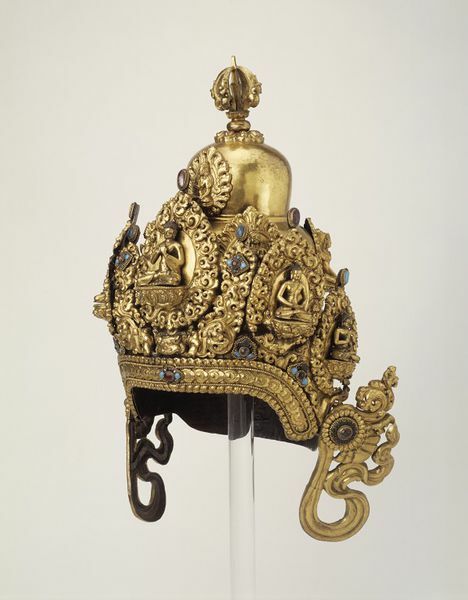 The crown is surmounted by a five-pronged half-vajra. A dated inscription (Nepal Samvat 797) invokes Vajrasattva, the supreme deity of the vajra sect. A number of these crowns have survived, but this example is the finest and most complete. Elaborate crowns of this type are worn by Vajracaryas, Buddhist priests, when officiating at religious ceremonies. Vajracarya, "master of the thunderbolt", is both a caste and family name indicating those entitled to perform priestly functions. They command the highest rank in the Buddhist community, the equivalent of Brahmans in the Hindu context. They typically use both a vajra (thunderbolt sceptre) and ghanta (ritual bell) in these rituals. This crown has individually cast medallions depicting bodhisattvas on the dome and Vairocana in the centre. The crown is surmounted by a half-vajra. A dated inscription (Nepal Samvat 797) invokes Vajrasattva, the supreme deity of the vajra sect. W. Zwalf, Buddhism: Art and Faith, British Museum, 1985, p.126. Guy, John: 'Indian Temple Sculpture', London V & A Publication, p.59. pl.59. Guy, John (ed.). ‘L’Escultura en els Temples Indis: L’Art de la Devocio’, Barcelona : Fundacio ‘La Caixa’, 2007. p.142. valley society, with a position as one of the highest castes. cannot now be used for that purpose.